Never Enough Nails: SinfulColors A Class Act Collection Fall 2015, Part 2! SinfulColors A Class Act Collection Fall 2015, Part 2! I FINALLY have the second half of my SinfulColors A Class Act collection swatches today! I am sorry for the delay, but the weather has been so completely beautiful and I've been trying to take advantage of that as much as possible. This, sadly, leaves not much time left for swatching. But I got myself together today to show you these five fantastic polishes. First up is SinfulColors Blue Sensation. Blue Sensation is a soft powdery blue with ribbons of silver shimmer. It dries to a lovely satin matte finish that reminds me of my beloved OPI Suedes (still love you babies!). 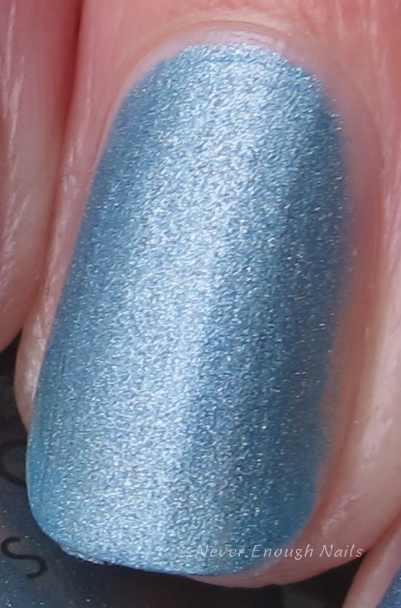 This is a really interesting way to do baby blue, with a different shimmering matte finish. This is two coats of Blue Sensation. It was pretty easy to apply. Definitely let it dry completely between coats, or else you risk patchiness and streaks. These pictures are without top coat, but I imagine it would look nice shiny too. SinfulColors Fig is a lovely moody plum with hidden shimmer. It's not over the top shimmer, it's kind of Chanel-like actually, very sophisticated. Fig has some red tones to it, like a red grape. This is going to be my #1 pedi shade this fall! So pretty! This is three thin coats. In person, it was nicely opaque, even though I can see some sheerer patches in these pictures. The formula was a little on the thin side, so make sure you wipe off your brush well to avoid pooling and flooding the cuticles. This pop of punchy purple is SinfulColors Hazed. Hazed is a pinky purple with a demo-matte finish. SinfulColors describes it as a "subdued violet", but it's actually kind of bright and I love it! I like the finish of the demi-mattes in this collection, but just be aware- they seem to take awhile to dry. You could always use quick dry top coat, but that gets rid of the neat finish. This is three coats of Hazed. It was pretty sheer on the first coat, but built up nicely. It was easy to apply. SinfulColors Blackboard is a demi-matte black with a tinge of deepest forest green. It looks slightly greenish only in bright light. I love that they called this "Blackboard" in a Back to School collection, so cute! This is three thin coats of Blackboard. I thought it would be more pigmented, but the first coat was kind of sheer, like Hazed. This also takes forever to dry. I don't think it was dry at the time of these pictures and I had been waiting forever. It also didn't dry completely in between coats, so it's kind of uneven as well. Not my fave formula of the bunch. SinfulColors Ice Blue is a stunning blueberry glass fleck shimmer with flashes of pink iridescence. This is just really gorgeous in person. The glass fleck shimmer is silver, but has almost like a pink duochrome effect to it. The base is a great frozen blue color with hints of purple, very icy and cool-toned. This is four coats. Ice Blue is pretty sheer. I still had a good amount of VNL at three coats, but it applied very well. You could definitely layer this over a base and still see the spectacular shimmer. If you missed the first half of my SinfulColors A Class Act swatches, check them out here. I think my favorites of this collection are Truth or Lavendare, Summer S-cool and Blue Sensation. I love all of the demi-mattes, I am still such a matte lover! !